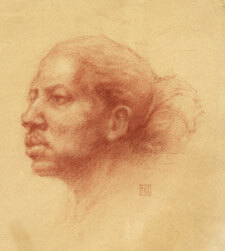 The self-portrait above is a sample caricature. More classic portrait styles for painting Roger, Alan, and Toby are shown below. 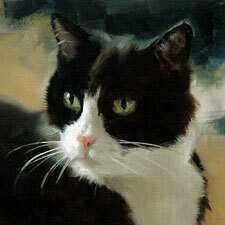 I was born in the suburbs of Washington, D.C., and have been an artist since I can remember. I have always been drawn to faces more than anything else, and have had an obsessive love of portraiture since I was 12. I doodled faces incessantly. 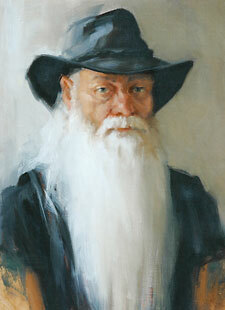 When I was 16, John Singer Sargent was my hero. I knew my path lay in the art field. I moved to New York and attended Pratt Institute, hoping that I would find a way to turn my passion into a career choice. Although I was drawn to ìold schoolî painting, practicality drew me into the more financially stable world of graphic design. After a 25-year career as a graphic designer, I decided to take a painting class in an effort to find my creative mojo again. 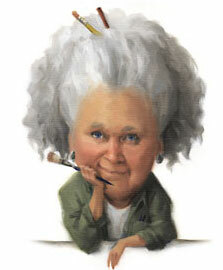 Watching my first teacher do a portrait demo was an epiphany for me; I didnít realize that this kind of art was still being done. I have studied with some wonderful teachers for a number of years, among them Clayton J. Beck III, Daniel Keys, and Michelle Dunaway. The one who influenced me the most, however, was Robert Liberace with his passion for the Italian Renaissance. His work not only embodies the aesthetic I admire, but as a teacher he allowed me to grow as an artist and encouraged me to find my own style. I have found my experience in graphic design to be extremely valuable in the design and composition of my still lifes. 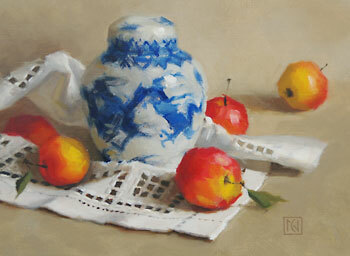 "Ginger Jar and Crab Apples" is a bit more relaxed style of still life than the one above. I came to visit a friend in Brattleboro and fell in love with the town -- the funky art vibe and the fact that I have never seen so many people whose portraits I wanted to paint in one place. 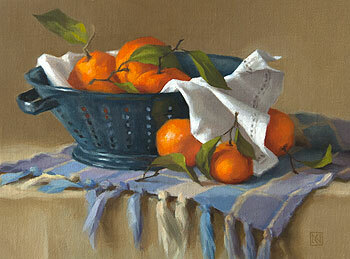 In the last ten years, there has been an incredible resurgence in the popularity of traditional art. I want to share my enthusiasm for classical painting and have opened Fat Cat Studio in the hope that it becomes a place where people who have that same passion can gather to share ideas and improve their painting skills. As a Portrait Society of America ambassador for Vermont and New Hampshire, I will be holding classes and quarterly PSoA events. If you are interested in classical painting and drawing, please contact me, either through my website at catherinenunn.com or by email at catherinenunn.com or by email at catnunn@comcast.net. My studio is open most afternoons and for Gallery Walks. Stop by to say hello.